Rafts on the Eel River on April 10. On the day of the vehicle went into the water, April 6, the water was up to the brushline. 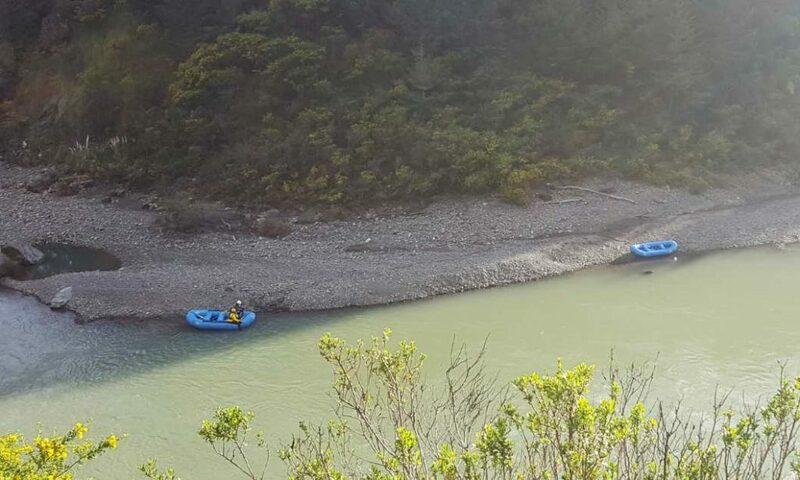 MENDOCINO Co., 4/11/18 -- The Mendocino County Sheriff's Office is teaming up with various other local rescue agencies to continue the search for the vehicle which was lost in the Eel River April 6, suspected to be the car of a Santa Clarita area family who are missing. The MCSO issued a press release today, listing the agencies and including some pictures of the section of the river where the car was reported lost. the Little Lake Fire Department Swift Water Component Teams, the Ukiah Valley Fire Department and the Hopland Fire Department. On April 6, 2018, at approximately 1310 hours, Humboldt Communications Center (HCC) received a report of a vehicle over the side of a steep embankment on US-101, south of Dora Creek in Northern Mendocino County. Upon the arrival of emergency personnel, the involved vehicle was completely submerged in the Eel River. 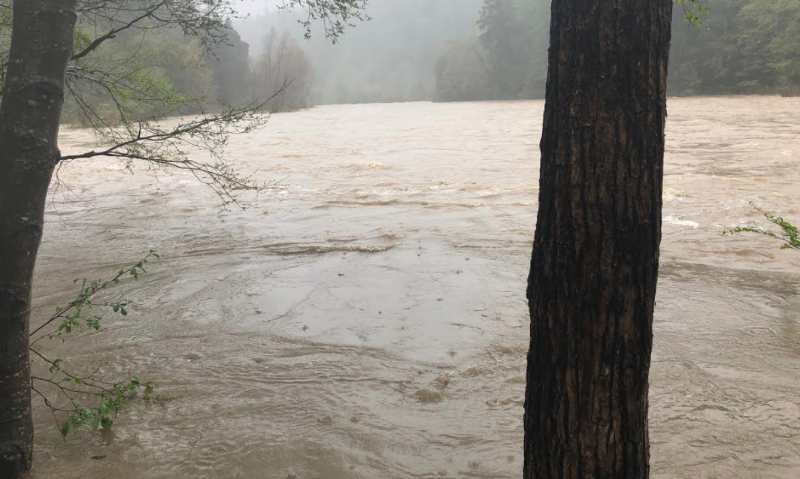 The California Highway Patrol, Southern Humboldt Technical Rescue, Piercy Volunteer Fire, and Leggett Volunteer Fire Department all responded to the scene to assist, however due to the strong river current, and the poor clarity, the vehicle was unable to be located. CHP and emergency personnel have continuously searched and monitored the river in attempts to locate the vehicle. CHP has also utilized its helicopter in attempts to locate the vehicle. On April 10, 2018, the Garberville CHP established an joint incident command with Mendocino County Sheriff’s Office, Cal-Fire, Leggett Volunteer Fire, Piercy Volunteer Fire and Southern Humboldt Technical Rescue to organize continuous search efforts for the missing vehicle and occupants. All available resources are being utilized by searching personnel. Through the collaborated efforts of all the involved agencies we are working to resolve this incident as quickly and safely as possible. Rescue personnel will be searching the immediate and surrounding areas and constantly evaluating the condition of the river and the weather during the search efforts. Once the vehicle is located then a recovery plan will be developed to safely remove the vehicle from the Eel River. 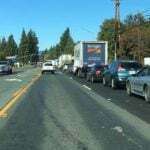 Ongoing press releases and updates/photos will be posted on the Mendocino County Sheriff's Office facebook page as information becomes available (https://www.facebook.com/MendocinoSheriff). 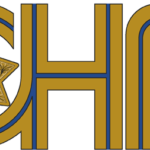 Anyone wishing to subscribe to the Sheriff's Office automated press release notification system can do so by visiting www.mendocinosheriff.com and by accessing the press release page on the website. Captain Gregory L. Van Patten #1184"